Plants and fungi that affect the mental state of the consumer have been a part of cultures and subcultures of civilization since early man first noticed that some plants altered awareness of the physical world in an extraordinary way. The holy men and healers of the ancients used these psychoactive plants as a means of exploring non-physical realms to expand their abilities to minister to the clan. Healers found their abilities to treat physical ailments greatly increased, as many of these plants have sedative or calming effects and some are narcotic painkillers. Shamans, who frequently performed the function of both doctor and priest, also found the hallucinogenic or consciousness expanding qualities of plants to be useful tools in their spiritual ministering to the tribes. Today, we use these plants in much the same way, and also recreationally, to escape the pressures of our modern world. In Herbs of the Northern Shaman, Steve Andrews describes in clear, understandable terms the plants, their active constituents, the dosages, and their effects on the human mind and body. Many photos and illustrations are included. You will find information on the expected plants such as Cannabis, Datura, and :peyote as well as the unexpected effects of such common garden favorites as Buttercup, Sassafras and Water Lily. Author Steve Andrews, Member of the Council of British Druid orders, Quest Knight and Bard of the Loyal Arthurian War-band, Principal Bard of The Traveling Court of Camelot, Bard of The Free Gorsedd of Bards of Caer Abiri (Avebury), Affiliate Member of the Highway Poets Motorcycle Club, and Member of the British Killifish Association, has drawn upon his lifelong interest in plant culture, and has produced a most useful guide to mind-altering plants that have the potential for shamanic use and grow wild in the Northern Hemisphere. 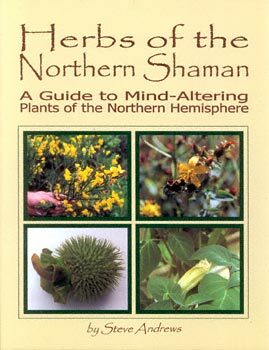 Whether you are an explorer of alternate realities or a botany buff and consummate student, Herbs of the Norther Shaman: A Guide to Mind Altering Plants of the Northern Hemisphere is an easily accessed reference that no serious student should be without.